Bills that threaten homeowners and small businesses are currently moving through the legislature! The new Legislature is dominated by pro-tax politicians who have a two-thirds supermajority in Sacramento. Bills that undermine the taxpayer protections in Proposition 13 have been introduced and are being heard in committees. If approved, these bills could cost every property owner thousands of dollars annually. Sign up for our free e-mail updates and HJTA will alert you to these and other developing threats to Proposition 13 and taxpayers. Assembly Constitutional Amendment 1 (ACA 1), Cecilia Aguiar-Curry (D—Yolo County): This amendment makes it easier to raise property taxes to pay for any type of government project. It lowers the vote threshold from the current two-thirds vote — as mandated by Proposition 13 — to just 55% for a new or higher special tax to fund “infrastructure” or “affordable housing.” Under this bill, the definition of a special tax includes sales and parcel tax increases, both of which are very regressive. California has the highest sales tax in the nation, and parcel taxes add hundreds of dollars of new taxes to the one-percent tax rate property owners already pay under Proposition 13. ACA 1 also lowers the vote threshold from two-thirds to 55% to approve bonds, as has already been done for local school bonds (by Proposition 39 in 2000). While all voters are able to vote on this debt, only property owners pay it. Lowering the threshold for local school bonds has added billions of dollars of new debt on property tax bills since 2000. Considering that this debt is often on property tax bills for at least 30 years, maintaining a higher voter approval threshold is crucial to protecting current and future taxpayers. ACA 1 also does nothing to address California’s affordable housing crisis. Right now, one-third of renters spend half of their take-home pay on rent, only 30 percent of Californians can afford a median-priced home, and only 53 percent of Californians are homeowners statewide, well below the national average. Adding hundreds of dollars a year to individual property tax bills won’t make home ownership more affordable. Status: Assembly Constitutional Amendment 1 is currently awaiting a vote in the Assembly Appropriations Committee. Senate Constitutional Amendment 5 (SCA 5), Ben Allen (D—Los Angeles) and Jerry Hill (D—San Mateo): SCA 5 lowers the two-thirds vote for local school district parcel taxes to 55%, a direct attack on Proposition 13. The two-thirds vote threshold must be protected, because while everybody gets to vote on parcel taxes, only property owners pay. Parcel taxes are also very regressive in that every property owner pays the same amount regardless of the size or type of their property. In addition, there is no need to lower the threshold. A review of local parcel taxes on ballots since 2012 show that well over half were approved with a two-thirds vote. Status: SCA 5 is in the State Senate, awaiting multiple legislative hearings. 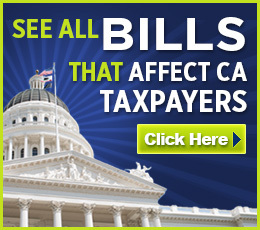 Click here to see the complete list of bills that threaten Proposition 13 and taxpayers. Tell your representatives that you oppose these bills, which attack your Proposition 13 protections. Click here to contact your representative. Click here to receive regular HJTA updates. Check back often to see the latest threats to Proposition 13 and to learn how you can fight back.